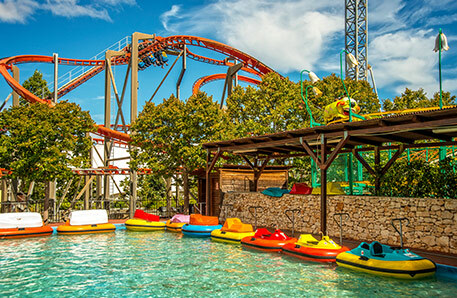 Close to the town of Fasano on the plain between the Valle d’Itria and the sea, there is a popular theme park, Fasanolandia which has both a safari and theme park rides. The zoo has over 200 species including tigers, giraffes and chimpanzees. It’s a fun excursion for family members of all ages. Acquapark Egnazia During the summer from June to September, Acquapark Egnazia offers a fun choice of water slides, a lazy river and two pools for playing and splashing. You can also hire sun beds and umbrellas to relax in the sunshine. Acqua Park Alberobello Just a couple of miles from Alberobello is a smaller water park, Acqua Splash Alberobello which is more suited to younger children with short slides and a couple of swimming pools as well as an onsite cafe. The park is open from early June to early September. Cycle Touring In Alberobello, the whole family can take a tour of the town and surrounding area by electric bike, Segway or golf buggy with visits to cheese makers or picnic options are available too. It's a lovely, slow-paced way to discover the countryside and rural way of life, unchanged for centuries. Grottoes Venture underground to one of the region's many grottoes. The largest are at Castellana and Putignano with guided tours of the Grotte di Castellano taking up to 2 hours to see the whole 2 mile network of caves.